Goal 1: To create and manage the structure and functions of multiple digital tools for end-user producer input, involvement, engagement and feedback within Arkansas, across the Southern region, and the United States. (see attached sample products) 1. SharePoint Site developed and resources loaded for project content curation beginning in August 2016. 2. Initiation of monthly project team meetings for support of communication, project management, and evaluation began on 9/29/16 utilizing the Zoom system. 3. SharePoint training delivered (and archived) for project team on 9/29/16 through Zoom webinar to support collection and sharing of project content. 4. Recruitment of a digital media/educational assistant for communication and outreach (11/16/16). 5. Creation and use of project Facebook, Twitter and Constant Contact accounts during 2017-2018 to expand and engage target audience and link clientele to the Blackberry Research Blog. 6. Twenty original digital newsletters were created and disseminated between 2017-2018 to target audience. 7. Two-hundred and twenty-five (225) posts were made by the research team to Blackberry Research Facebook and Twitter platforms from 2017-2018. 8. 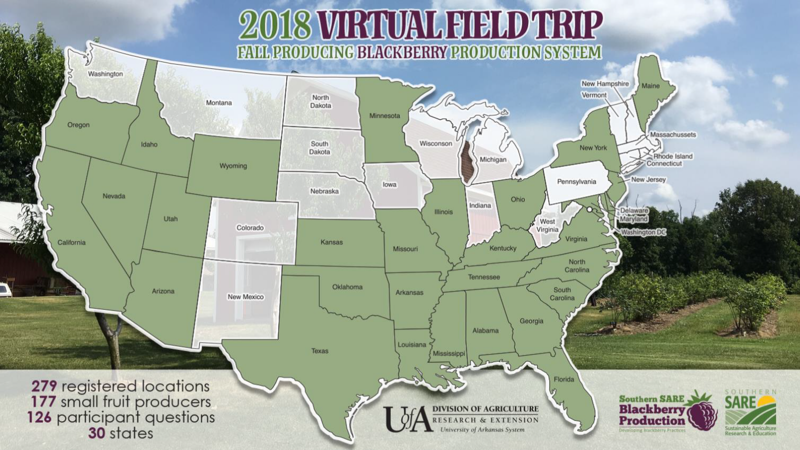 The August 15, 2018 Virtual Field Trip brought participants from 30 states and five (5) countries (Ghana, China, Greenland and the United Kingdom) to a blackberry farm in Tonitown, Arkansas, with researchers and producers jointly sharing information about primocane production practices and research results from this project. Goal 2: To grow a digital learning community for developing insights into the application and adoption of developing technologies. 1. Collection and curation of contact information for creation of an electronic community began in November of 2016. 2. Description of 2016 electronic community: 1,242 members (including Arkansas and regional (southern) farmers, blackberry propagators, AR SSARE Blackberry project team, AR FFA instructors (targeting youth audience), and Extension agriculture agents from across the county. 3. Boosted key Facebook posts to organically grow target audience within the digital community. 4. Cross-linked and promoted web blog posts through Facebook, Twitter and Constant Contact outreach posts with invitations to learn more about key/timely production practices and risk management tools aligned with the production. 5. Gained support of the North American Raspberry & Blackberry Association (NARBA) for digital posting and promotion of the 2018 Virtual Field Trip. 6. By October 2018, the Blackberry Research Project digital learning community had grown to a total of 3,761 non-duplicated individuals through Constant Contact and a documented combined reach through Facebook and Twitter of 38,370 individuals who were target audience members. Goal 3: To expand accessibility to the knowledge base during development and applied research. 1. Project branding tasks included: Logo development; creation of dedicated project home page on uaex.edu web-site; creation of seven supporting pages for home page; and over 250 print/pdf producer resources uploaded. 2. Editing and posting videos to digital sites. 3. Creation of original content and graphics for development of electronic newsletter. 4. Creation of Twitter, Facebook & Constant Contact accounts for support of launch of digital communications. 5. Peer review and curation of over 250 digital resources on the Blackberry Research Blog web pages. 6. Over 7. Live close-captioning of Virtual Field Trip during broadcast 8. Editing and posting VFT video and transcript on You-Tube for ongoing educational access. The Virtual Field Trip video has accessed by 456 viewers August-December of 2018.